So you’re thinking about an Exhale Fan? You’ve made a great decision! Here are some facts about Exhale Fans that you should know! Fact 2: The airflow is a vortex: The airflow profile makes the real difference in how you feel while in your space. Air exits the Exhale Fan in all directions 360° horizontally and at a 45° angle. This unique airflow starts a gentle rotation of the air much like a vortex. The vortex airflow profile generated by the Exhale Fan is unmatched in the ceiling fan industry. Air is not simply directed straight down but moves around the room in a pleasant cyclonic flow. What we have created is a destratified environment where floor to ceiling, wall to wall, you have a temperature balanced and comfortable space. Fact 3: Very quiet and gentle technology: The loudest this fan gets is equivalent to that of a quiet library and you don’t have to worry paper blowing around. Fact 4: A design to meet the needs of any customer: Form does not always have to follow function. We have worked tirelessly to create a minimalist design without sacrificing performance. The Exhale Fan fits comfortably in any room from the ultra-modern to traditional. Fact 5: First ever truly bladeless technology: Utilizing the turbine design, we are able to circulate air without blades. Say goodbye to the danger of bladed ceiling fans. Fact 6: Previously, the concept and implementation of a bladeless and high-performance ceiling fan was not available. After exhaustive testing and modeling, our patented fan is available and has no rivals. Fact 7: Based on our studies, the optimal configuration is a 20′ x 20′ foot with a flat ceiling. 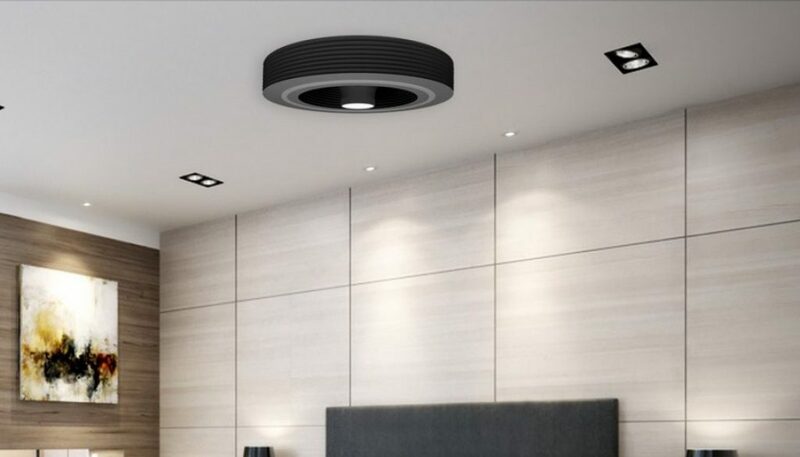 However, many of our customers have installed our fans on vaulted, irregular and false ceilings and have experienced our fan’s superior performance. For rooms greater than 20′ x 20′, additional fans are recommended for each 20′ x 20′ segment. Fact 8: Our leadership and management team has also changed for the better. Our manufacturing toolsets have been redesigned as well as our injection molding process. As a result, we are producing higher qualify fans and have been experiencing very few failures due to manufacturing or use. We have strict quality control standards. Our motor is guaranteed for 5 years and our fan assemblies have a lifetime guarantee. Fact 9: An LED light in a choice of warm or cool bright light is included with all Exhale Fans. Fact 10: Our Generation 4 fans, debuting summer 2018, include Bluetooth connectivity. We address our customer’s requests with innovation. Fact 11: We’re growing to produce thousands of fans per month, instead of hundreds! With the current demand for our fans, by the end of 2018, we will be producing more than 15,000 fans per month and will be shipping from stock rather than monthly production runs. We have also opened a new Louisville, KY metro area distribution facility staffed with professionals to meet our increasing sales. Fact 12: We enjoy keeping you informed. Our NEWS&FAQ section is being updated regularly with news, shipping information and FAQ. We’re also providing answers to our customer’s telephone calls and “contact us” with expanded coverage. Many times your telephone calls are answered without having to leave a message and your emails are answered with hours, sometimes within minutes. Fact 13: We are selling our fans worldwide. To reduce shipping cost and import duties, we’re expanding our distributorship partners to meet our customer’s demands and keeping costs down. Team Warm or Team Cool? Copyright © 2018 Exhale Fans LLC. All rights reserved worldwide.